10. SU-37 by Steve Shumate: The SU-37 by Steve Shumate is a monster of a parkjet. Not in size or anything, but it's just one of the most impressive parkjets you can build. It features dual thrust vectoring, smooth lines and great flying abilities. Not an easy build, but for the patient, it will be the crown jewel of your fleet. Oh, and you can short-cut the whole building time by getting a kit straight from 6mmFlyRC. 9. F-22 by Tomas Hellberg: Did you see our interview with Mr. Hellberg? If you did, you would know that his F-22 is one of the best, simplist, easy to build parkjets out there. His design features tabbed construction and a simple thrust vectoring that can flip the airframe on a dime. A mid motored raptor that will put a grin on your face. 8. Mirage F1 by Marcel du Plessis: This is a new design to the free plans catalog, but we have to say, its one of the best looking. The Mirage has great lines and even captures the rounded intakes of the real thing. 7. SU-31 by Tomas Hellberg: The SU-31 is a throw back aircraft with the motor on the front. We know, its weird. But this is a nice alternative to all those typical warbirds you see out there. Tomas Hellberg has taken his simple tabbed construction and put it to good use here. 6. F-35 by RC Cal: The F-35 takes a lot of cues from the F-22 above and puts the lines of the U.S. Air Force's newest plane into foam. It has a mid motor mount, large wings, simple tabbed thrust vectoring, and a size that fits into any car. 5. Hydro: This design has remained popular for over a year. The Hydro is a hybrid plane/boat that can wow the crowd at just about any small park. 4. Eurofighter by Jamie Rothwell: This design is super popular and keeps moving up the charts. Is it the EDF capability? It is the simple score and fold design that gives the Eurofighter a full fuse with little fuss? This design is a winner. 3. 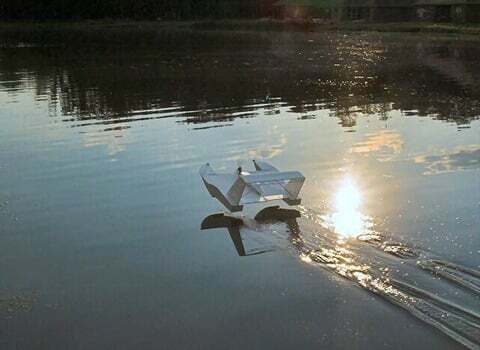 Mermaid by Marcel du Plessis: A water plane that keeps the prop up and the plane flying off the water or grass. A simple design by one of the best designers out there. The Mermaid with a little work can be one of the most unique planes at the park. 2. F-22 by Steve Shumate: The F-22 has been the king of Parkjets for the better part of since forever. The scale design, thrust vectoring, and great performance has kept it at the top of the list. And you can get clear canopies or a whole laser cut kit from our sponsor if you don't feel like cutting out the 70+ pieces yourself. 1. The SU-37 by Jamie Rothwell: This new modified design by Jamie Rothwell has the score and fold method he has perfected along with better performance than his first design. At 80% of the first design, plus some improvements, coupled with the ability to turn it into an SU-35, this design rocketed to the top of the list. Let's see if it stays that way! Remember you can pick up a lot of these designs from 6mmFlyRC.com. The kits they provide are laser cut and some of them include things like clear canopies and other hardware to give you a more polished kit.